Testimonial from customer in Sydneham, SE26. Original Edwardian marble restoration, Herne Hill (SE24), South East London. We removed and restored an original Edwardian marble surround and cast iron tiled insert, the fireplace was fully restored and then installed on a slate hearth. The shelf had been broken into 2 pieces before restoration. Testimonial from a customer in Balham, South West London. The fireplace looks amazing – thank you so much. It looks really impressive – what an improvement – it will be the highlight of the room! Thank you also for your sensible advice – help with sourcing the perfect tiles and being so reliable in terms of appointments etc. Restored fireplaces installed in Wimbledon (SW 19), South West London. We restored an original Edwardian cast iron arch insert for a customer, supplying a pine Edwardian corbel surround in one room and supplied a beautiful original restored Edwardian cast iron arched insert, Edwardian corbel pine surround and slate hearth in another room. Both fireplaces were installed decoratively and with pine surrounds to be painted. Restored Victorian fireplace installed in Brockley (SE4), South East London. We installed this original Victorian tiled combination on a slate hearth for solid fuel in Brockley, South East London. Edwardian period cast iron tiled combination fireplace, restored and installed in Walthamstow (E17), East London. 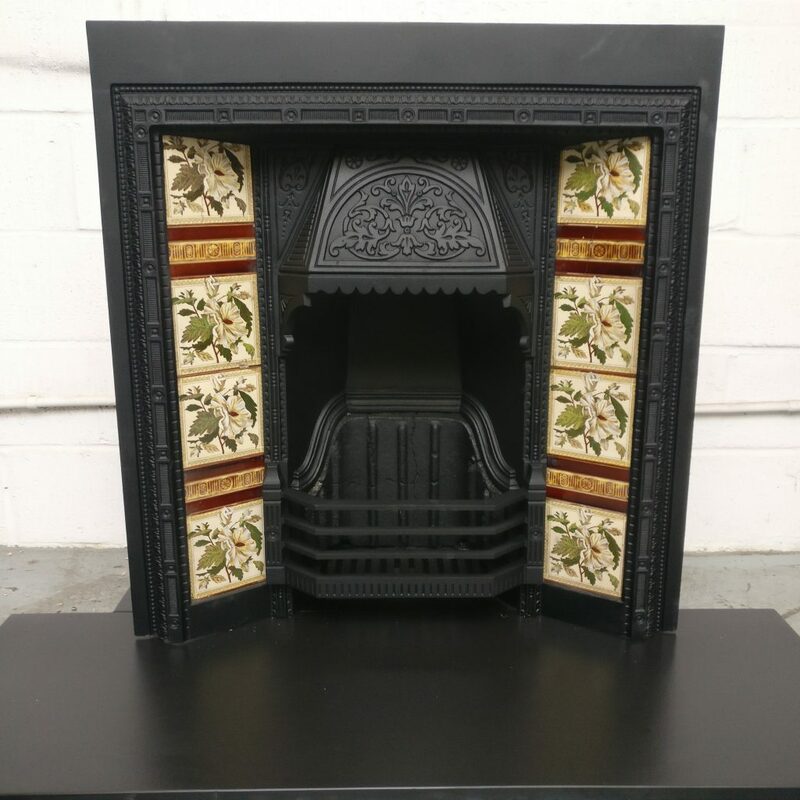 We collected, restored and reinstalled this beautiful original Edwardian cast iron tiled combination fireplace, the installation was for a purely decorative feature in the room. Restored original Edwardian cast iron surround and cast iron tiled insert installed in Camberwell (SE17), South East London. We restored an original cast iron tiled insert and surround before installing for solid fuel with a slate hearth for an old customer. Reproduction marble surround installed in Camberwell (SE17), South East London. 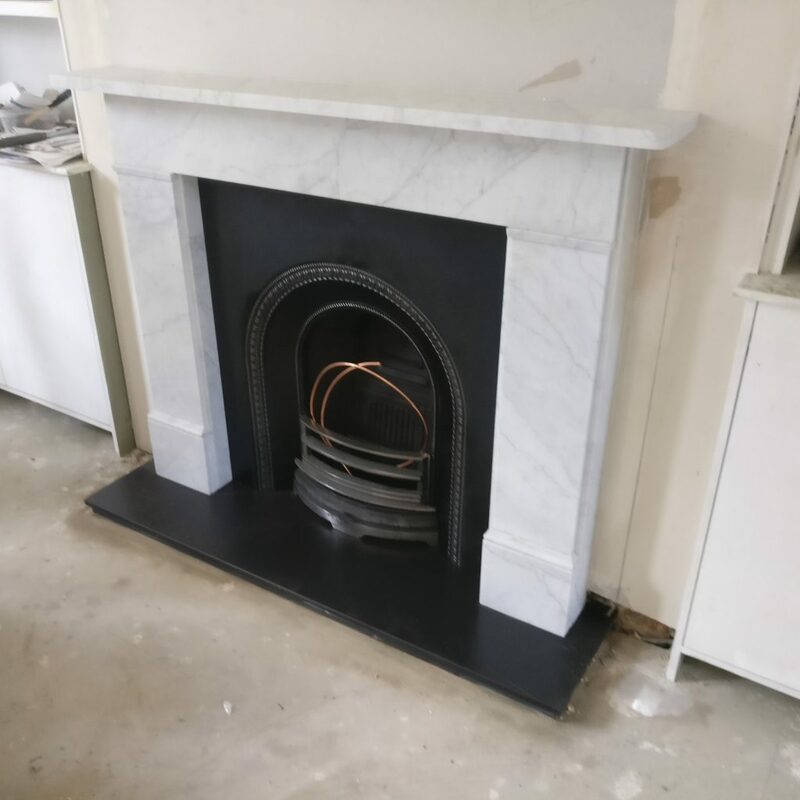 A reproduction Flat Victorian marble surround, slate hearth and slate slips. Installed for use with a stove, to be installed later. All supplied and installed by us in Camberwell (SE17), South East London. 4 weeks ago we removed a Edwardian slate surround and cast iron tiled insert, an Edwardian tiled combination fireplace and a small combination fireplace for restoration. They all were restored and reinstalled this week. The slate surround pictured below was restored back to honed slate and will be having a tiled hearth later on. The fireplace was installed for solid fuel use. We supplied and installed this limestone fireplace for use with a gel burner. The fireplaces design is based on a Victorian period style but given a modern twist to fit in a contemporary Victorian flat conversion. Fireplace restoration in Cambridge (CB4). We removed a large Edwardian slate surround and cast iron tiled insert, a cast iron tiled combination and a small cast iron combination for refinishing and refitting. The slate surround will be stripped down to its individual parts, the original lacquer finish will be stripped off and the slate honed, the surround will be rebuilt and given a primer finish as it’s due to be painted on installation. All the cast iron will be sandblasted, repaired, fitted with missing parts and sprayed in our heatproof matt black paint and reinstalled with slate hearths. The work will take approximately 3 weeks start to finish, we will post before and after pictures after installation. 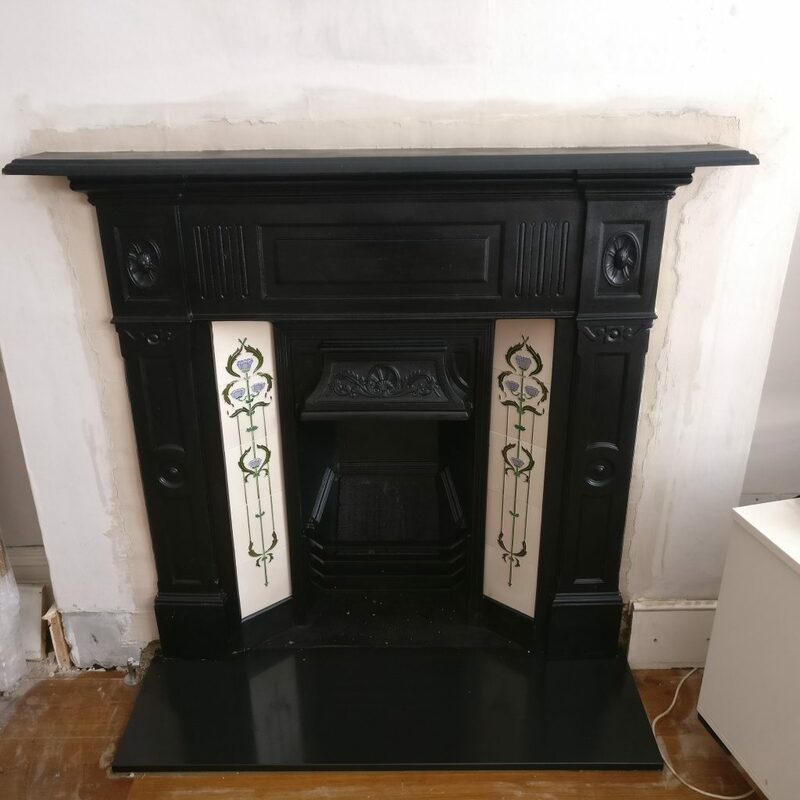 Edwardian fireplace restoration in Sydenham (SE26), South East London. 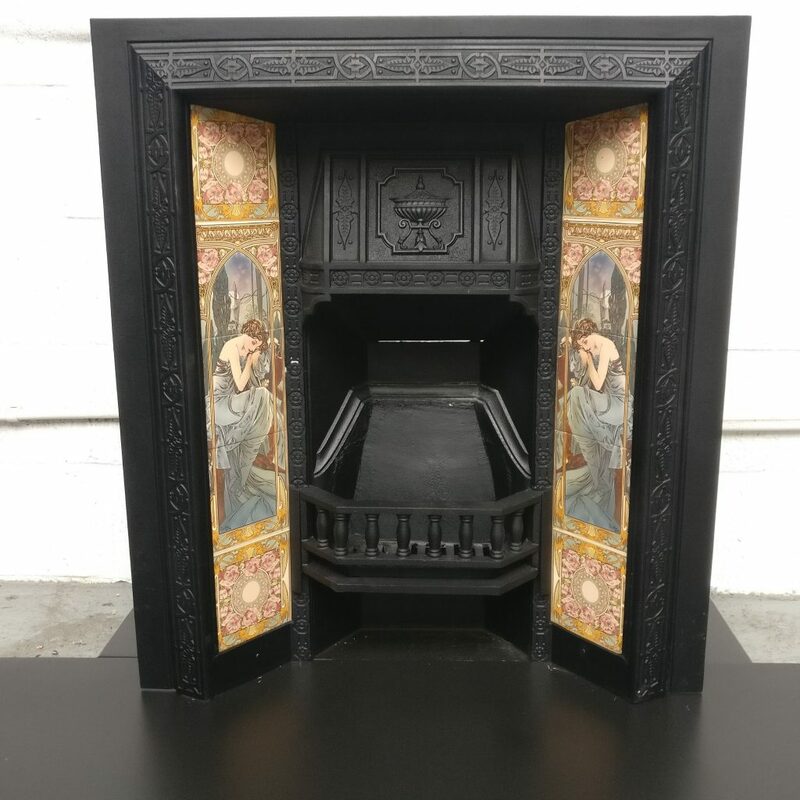 We removed an original Edwardian cast iron combination fireplace that had been badly fitted, it was transported back to our workshops where it was sandblasted and refinished in matt black before being refitted with a slate hearth. More antique period fireplaces added for sale. Fireplace restoration in Belize square (NW3), North West London. 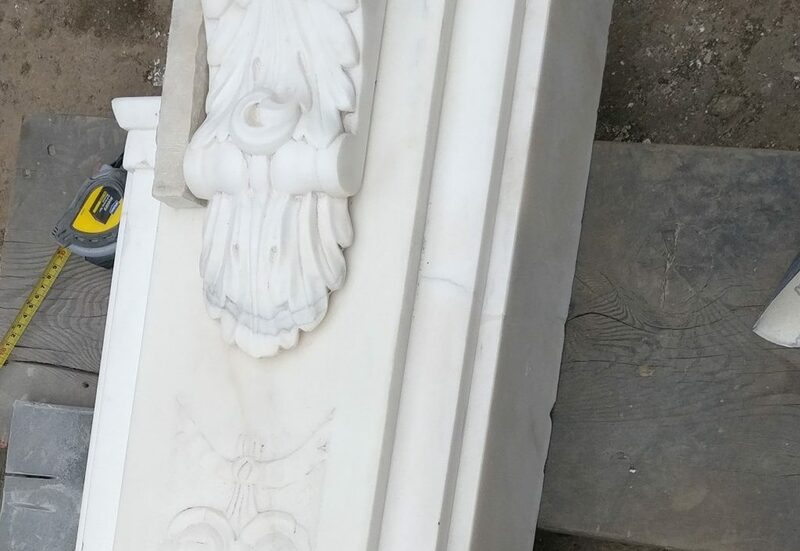 We picked up a beautiful original Victorian white statuory marble surround for restoration, it was in a really bad way and took a lot of work to turnaround. Fireplace restoration in Richmond (TW10), South West London. We removed and restored an original Georgian marble crossover surround and cast iron arch insert. The fireplace was then refitted for gas use, we also supplied 2 reproduction arch inserts and 2 reproduction crossover marble surrounds. All the fireplaces were installed on slate hearths for gas use. 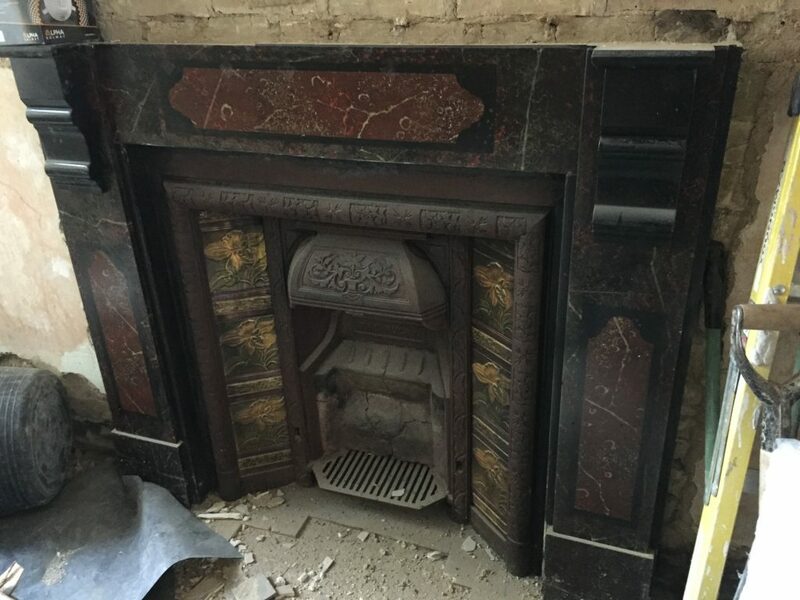 Antique Victorian fireplace restoration in Kensington (W8) West London. We removed 2 Victorian slate surrounds and cast iron inserts for restoration, conversion to gas and installation with slate hearths. The surrounds were stripped, polished and rebuilt before having a primer coat added so the client could paint. The installation was for gas use with Nu-Flame gas fires, the gas fires will be added at a later date when the property is ready. Busy week removing antique fireplaces all over London for restoration. 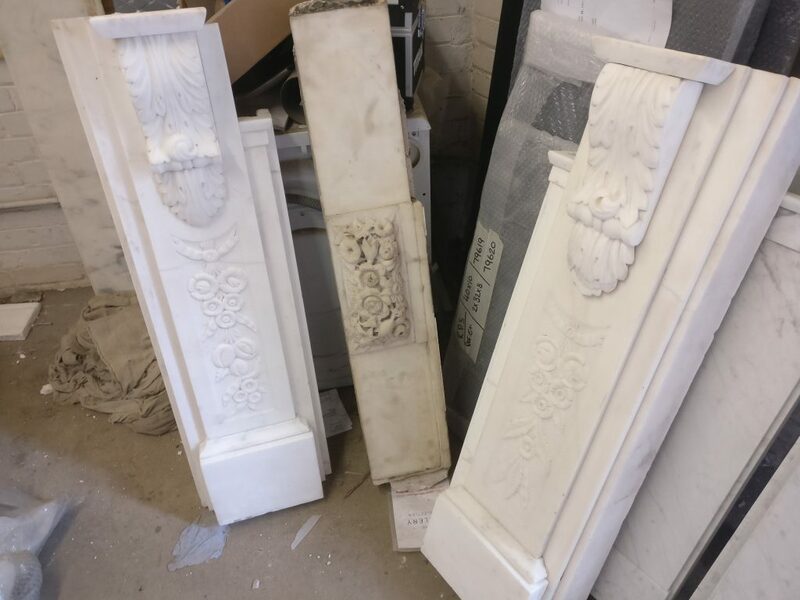 This week as well as all the installations we are also removing lots of antique fireplaces for restoration all over London, Marble surrounds from Belize Park (NW3) and Muswell Hill (N10). Antique cast iron surround and insert from Dulwich (SE21). Two original slate surrounds from Forest Hill (SE23) and a an antique small bedroom fireplace from Tunbridge Wells (TN1). Busy week!! Before and after photos coming soon. Fireplace supplied and installed in Brockley (SE4), South East London. We removed the customers first attempt at having a fireplace installed and replaced it with a more period look with a slate hearth, Abbey Fireplaces Telford arch insert and a bespoke pine surround. The surround will eventually be painted white to match the skirting. The installation was purely decorative. Previous supply and install in East London, photo provided by customer. We supplied the original antique Victorian cast iron fireplace, along with slate hearth, wood surround and gas fire. Edwardian marble surround restored and installed in Beckenham (BR3), Kent. We removed, polished and rebuilt a beautiful Edwardian marble surround in Beckenham. The surround removed from a back room and was refitted with a restored reproduction cast iron arched insert and slate hearth in place of a tatty wooden surround in the front room of the property. 2 beautiful bespoke reproduction marble surrounds supplied and installed in Hilly Fields, Lewisham (SE4), South East London. We worked with the customer from start to finish, to perfectly size these stunning bespoke Victorian corbel surrounds and then installed both with slate hearths, slate slips and Morso stoves. The end result is simply stunning, a blend of period and modern styles suited to modern living. 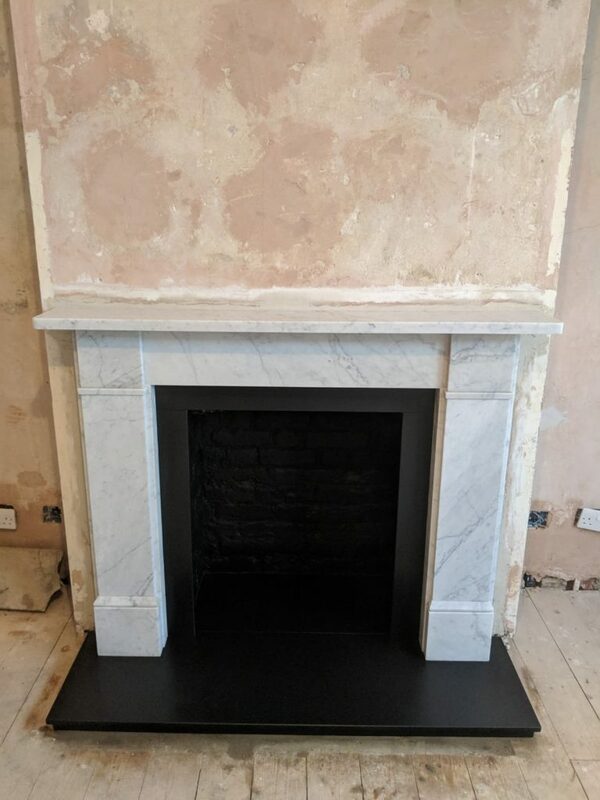 Our customer chose to retain the faux marble painted finish of the slate surround so after a complete rebuild we worked around the original finish redoing the black laquer but leaving the faux marble intact. The surround was reinstated with a slate hearth, slate slips and an Aarrow Ecoburn plus 5 wide-screen stove. Customer feedback from a stove installation. We supplied and installed an Abbey Fireplaces Cleve in marble along with slate slips and a slate hearth for use with the customers own stove, a very striking fireplace! “Finally had the stove installed and it looks great! Thanks again for installing the fireplace for us. Customers testimonial form East Dulwich (SE22), South East London. Fireplace supplied and installed in Kennington (SE17), South East London. We supplied and installed a beautiful Abbey Fireplaces Cleave white marble surround with a slate hearth and slate slips for use with a stove. Customer to finish painted chamber brickwork. Another happy customer in Brockley (SE4) South East London! 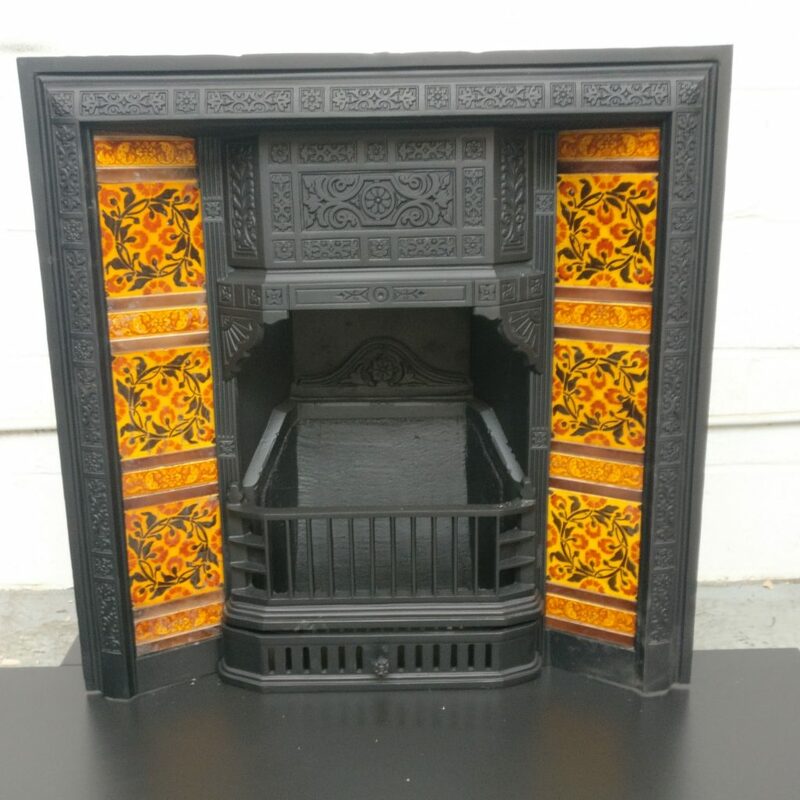 A review of a Victorian cast iron surround and tiled insert restoration, completed recently ​”Thank you for a really excellent restoration of my son’s fireplace and mantelpiece. He has just seen the finished work and is very pleased. 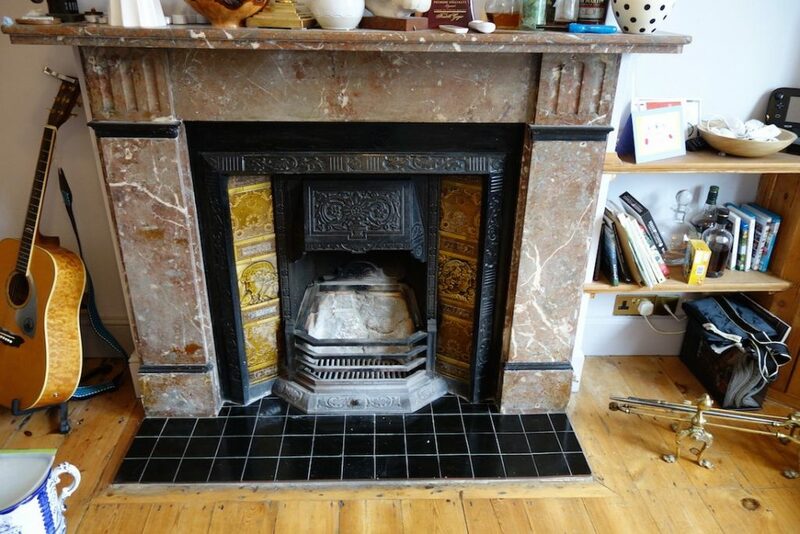 Stunning restoration of tired painted cast iron combination fireplace in Herne Hill (SE24), South East London. We sandblasted a tired old painted original tiled combination and then refinished with a full polish finish before reinstalling in Herne Hill, London. Original fireplace restored in Croydon (CR2), Surrey. Fireplace restoration in Tooting (SW17), South West London. Before After The cast iron surround was initially pinstalled with an ugly tiled block and painted brown with many layers of paint. We removed and sandblasted before refinishing with a satin White and installing with an original tiled insert from our stock and a bespoke slate hearth and gas coal effect fire. Slate fireplace restored and refitted in East Dulwich (SE22), South East London. We removed an original slate surround for restoration, originally the slate was covered in black laquer with a marbelised pattern. The customer felt it was too dark for the room but rather than replace it with a limestone/ white marble surround we stripped it and polished it out before rebuilding the surround and painting it white, it was then installed with a plain highlighted cast iron arch for use as a gas fire with slate hearth. 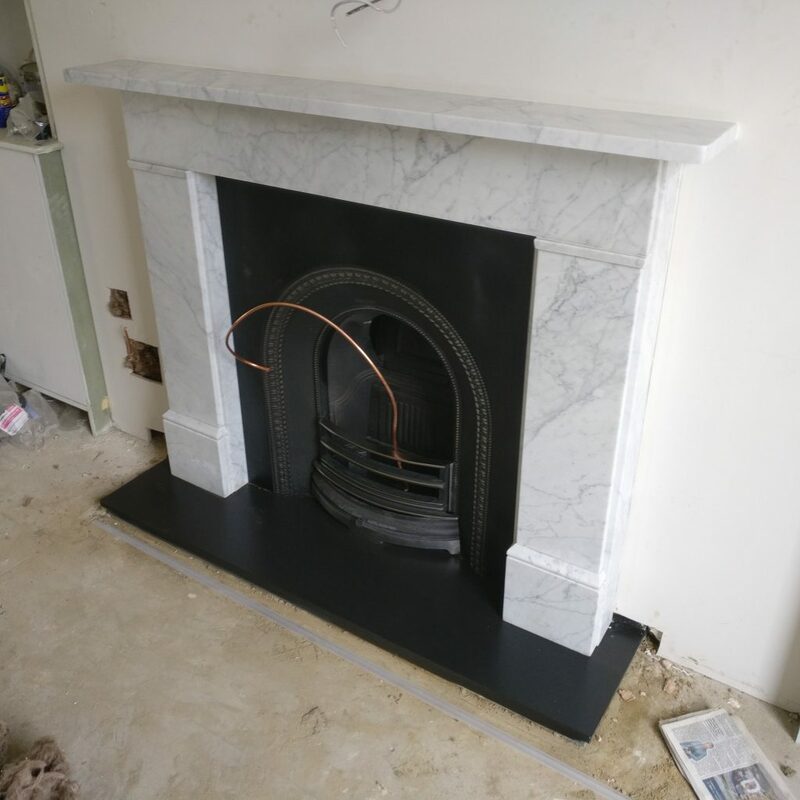 Bespoke Marble fire surround supplied and installed in Brockley (SE4), South East London. 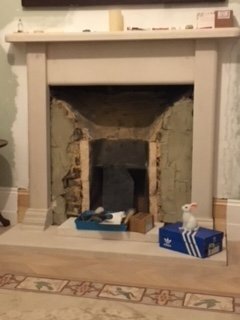 We returned to an old customers property to remove an old tired liver Marble arched fire surround, the surround want to the customers taste so was to be replaced but at 72″ it would need a big surround to take its place. We commissioned a 72″ Carrera marble fireplace to be made to replace the old one, installed it along with the original arched insert which had been sandblasted and restored at our workshop in Sydenham (SE26). The fireplace was reinstated with a slate hearth for solid fuel use. Fireplaces supplied and installed in Sydenham (SE26), South East London. We supplied and installed 2 Abbey Fireplaces Rochester tiled combination fireplaces in Sydenham. They are to be used as decorative installations only but look fantastic on granite hearths. Pics to follow. Restoration work undertaken in Forest Hill (SE23), South East London. 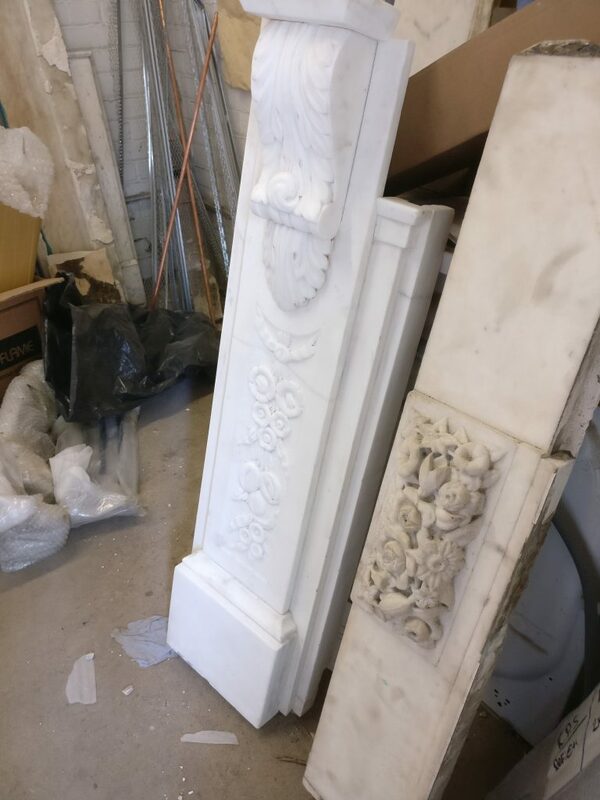 We are restoring 2 Victorian Carrera corbel fireplace surrounds for a new developer, they are eventually to be refitted with slate hearth as working gas installations. Pics to follow. 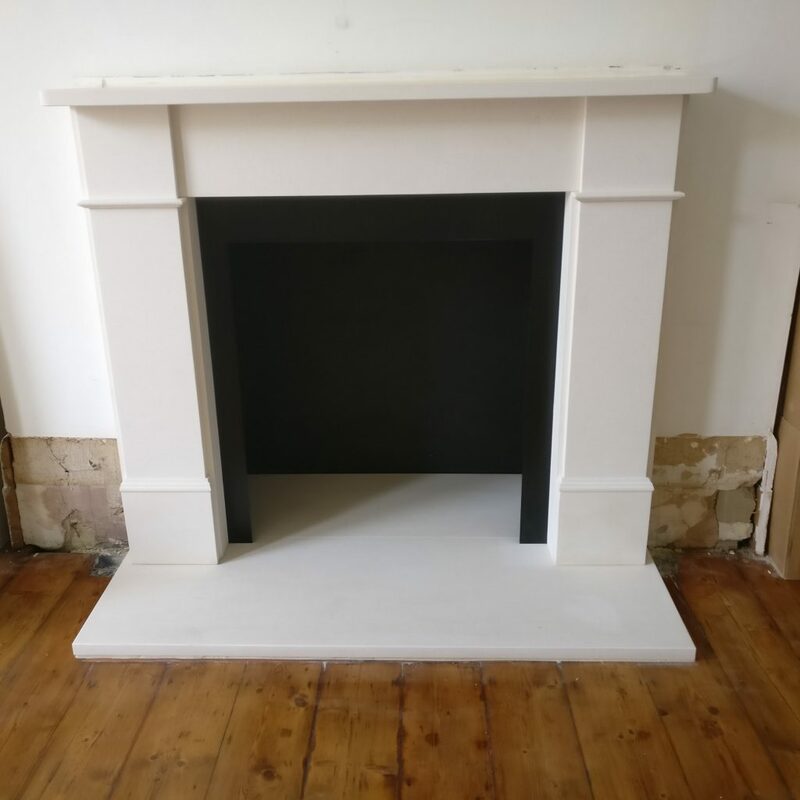 Marble fireplace restoration in Brockley (SE4), South East London. 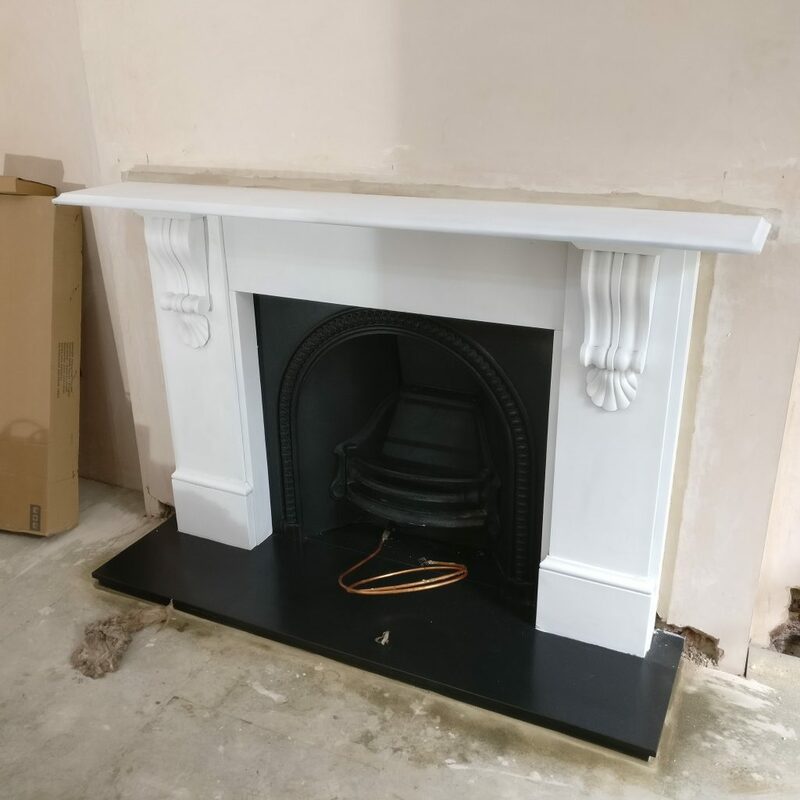 We removed and restored a Victorian black marble fireplace and cast iron arch insert in Brockley (SE4). The Victorian marble fireplace looked every bit it’s 140 odd years prior to restoration, After our extensive restoration work the fireplace was refitted, before plastering, looking a world away from where it started. 12 Victorian fireplaces removed, restored and reinstalled in Clapham (SW4), South West London. A huge restoration of a 2 side by side propertys in Clapham, derelict for years. An exciting project to be part of, both houses completely restored to there former glory. Project consisted off removing 8 Victorian cast iron surrounds and 1 slate surround. All cast iron restored to a highlighted finish and the slate surround stripped and polished before being rebuilt. We supplied a number of reproduction cast iron tiled inserts supplied from www.abbeyfireplaceslondon.com and 3 carrara marble surrounds . All fireplaces were installed as purely decorative items with slate hearths. Pics to be posted to www.facebook.com/rpsfireplaces soon. Victorian Fireplace restoration and fitting in Kew (TW9), Surrey. We restored a Victorian slate surround and 2 cast iron Victorian tiled inserts for a customer in Kew. The slate surround was stripped back to individual panels and rebuilt, the slate as is often the case was assembled from multi coloured slate so it was given a light coat of paint to make it indistinguishable from oiled black slate. One fireplace was installed as a a purely decorative install, the other installed with a bespoke gas fire. We took on a job recasting a cast iron front bar for a customer, we rebuilt the front bar in a 2 pack filler before sending it away for casting in iron at a foundry. Below is the customer feedback. Carron Fireplace supplied and installed in Crystal Palace (SE19), South East London. 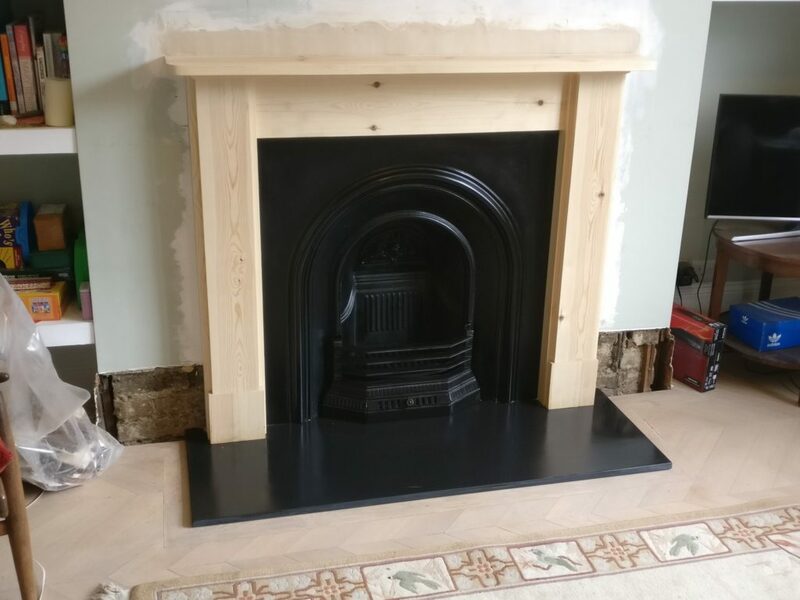 We supplied and installed a black Bella combination from Carron and a bespoke solid fuel slate hearth for use as a proper working solid fuel fireplace in Crystal Palace. We spent the last 2 days streamlining www.rpsfireplaces.co.uk ahead of a full rebuild of the website due to happen soon. Fireplace installed in Catford (SE6), South East London. We removed an old back boiler and installed a beautiful original Victorian fireplace in its place, ready for use as a solid fuel fireplace in Catford, London. Fireplace fitted in West Norwood (SE27), South East London. We were called in by a customer who had purchased an original fireplace, unfortunately it had been badly installed by the previous firm. We had to cut the plaster away and remove the tiled combination fireplace, remove all backfill from the chamber and then carefully reinstall the tiles correctly before refitting and plastering the fireplace ready for use as a solid fuel fireplace. Happy new year!! Back to work with a bang. Back to work this week, it’s full on at the workshop and fittings booking into February now, looks like it’s going to be a good year again!! 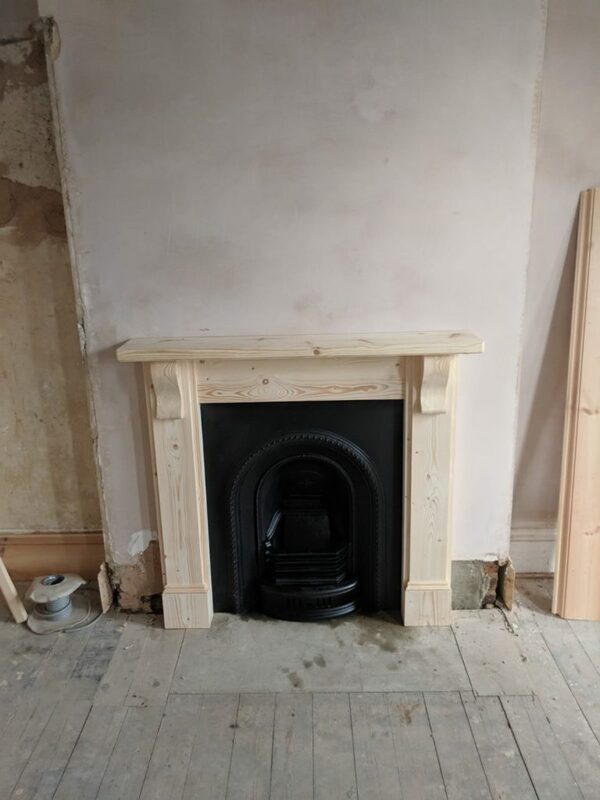 Restoration of 4 fireplaces in Crystal Palace , South East London (SE19). We ambitiously took on a restoration job for the complete refurb of 4 fireplaces with the caveat that we only had 3 days to do it, including removal and restoration of the inserts!! Monday saw us begin the job with 1 team removing all the cast iron arched inserts from the fireplaces and prepping the chambers and another team working on running the cast iron inserts back to the workshop (luckily only 10 minutes away) and sandblasting them before rebuilding and refinishing including new firebricks. The fireplaces were then reinstalled over the next 2 days with marble reproduction surrounds and slate hearths for use as working fireplaces. Clapham North restoration and reinstall. We have picked up where the contractor left off on the restoration of 8 cast iron fireplaces in Clapham. The fireplaces had been partially stripped with paint stripper. We have now removed all 8 surrounds for sandblasting and highlighting, they will be reinstated with slate hearths and reproduction cast iron tiled inserts. 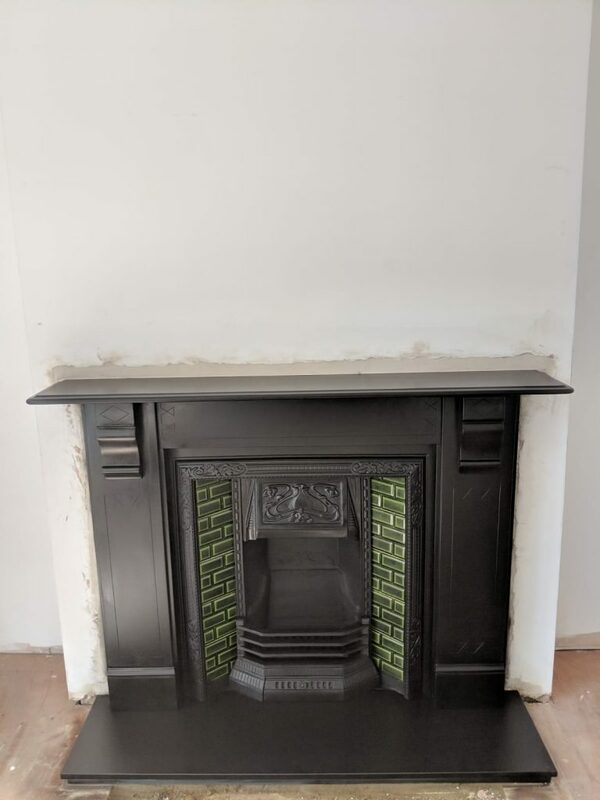 We are also restoring a slate surround and reinstalling with a reproduction cast iron tiled insert and slate hearth and supplying 3 reproduction marble surrounds along with tiled inserts and slate hearths. We will do before and after pictures in January when it’s all back in looking amazing! Feedback from a recent restoration project in Croydon. We removed and fully polished an original cast iron tiled fireplace, the fireplace was reinstalled with a new bespoke gas coal effect fire. Fireplaces supplied and installed in Peckham (SE15) South East London. ​ I am delighted with the fitted fireplace. Excellent work! 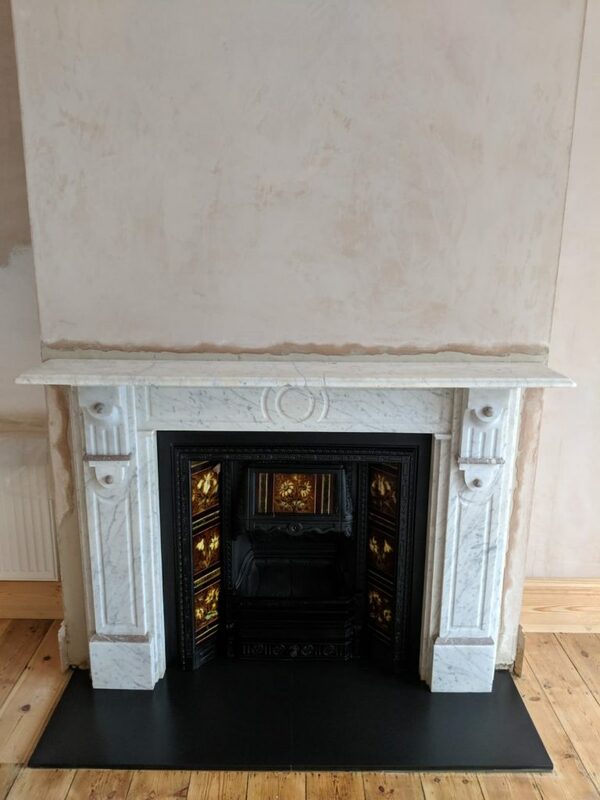 -M.Done (Kensington, West London) Marble surround restoration and cast iron insert rebuild with parts cast from a pattern in a local foundry to give a truly authentic finish and installed on a slate hearth for decorative purposes in West London. A rush job for a previous customer, we supplied a Carron fireplaces combination fireplace and slate hearth and installed before the decorators started. We are really happy with our newly installed fireplace – it makes the whole room look so much better. Thank you. We will definitely be recommending you to friends and family. 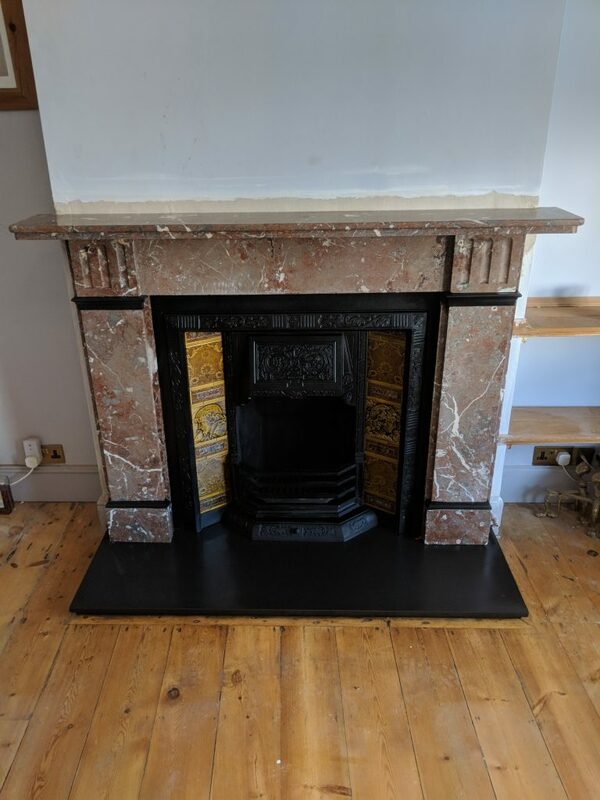 J.Bedlow (Bow, East London) We removed a marble surround, completely restored the surround and then supplied an original cast iron Victorian arched insert and a slate surround before refitting everything. Antique Georgian cast iron insert and surround restored and reinstalled in Tonbridge (TN9), Kent. We removed a stunning Georgian cast iron insert and cast iron regency bullseye surround from a beautiful 250 year old property in Tonbridge. The cast iron insert and surround where taken back to out workshop to be sandblasted , rebuilt and refinished before being installed as a decorative fireplace in another room in the house. Original fireplace restored and refitted in Newham (E12), East London. 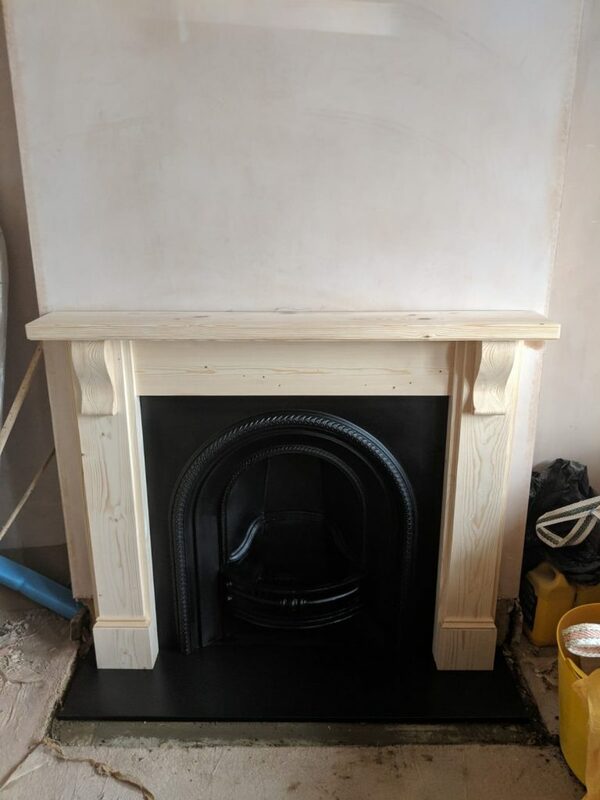 We collected a tired Georgian original insert fireplace from Newham, the insert was sandblasted and refinished in a heatproof matt black, we also supplied a made to measure pine surround and installed everything for use as a solid fuel fireplace in Newham (E12). 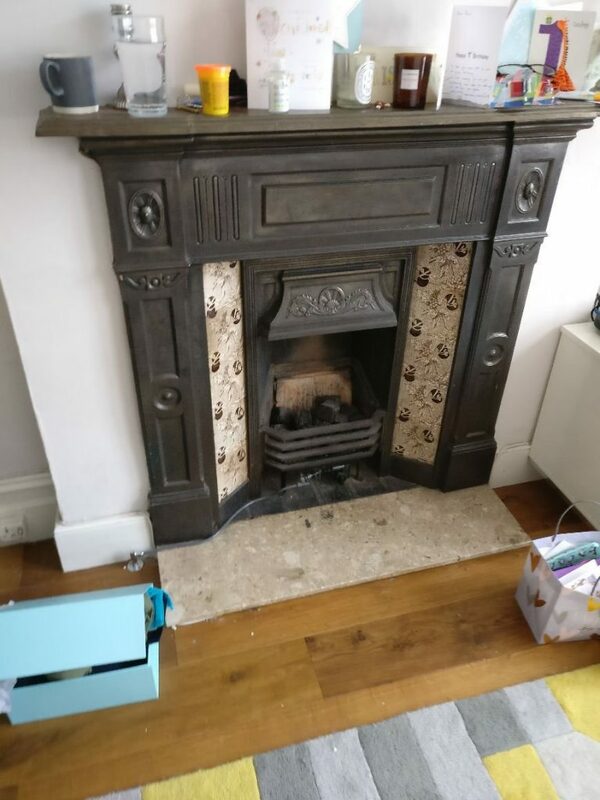 2 original antique fireplaces installed in Haringey (N8), North London. 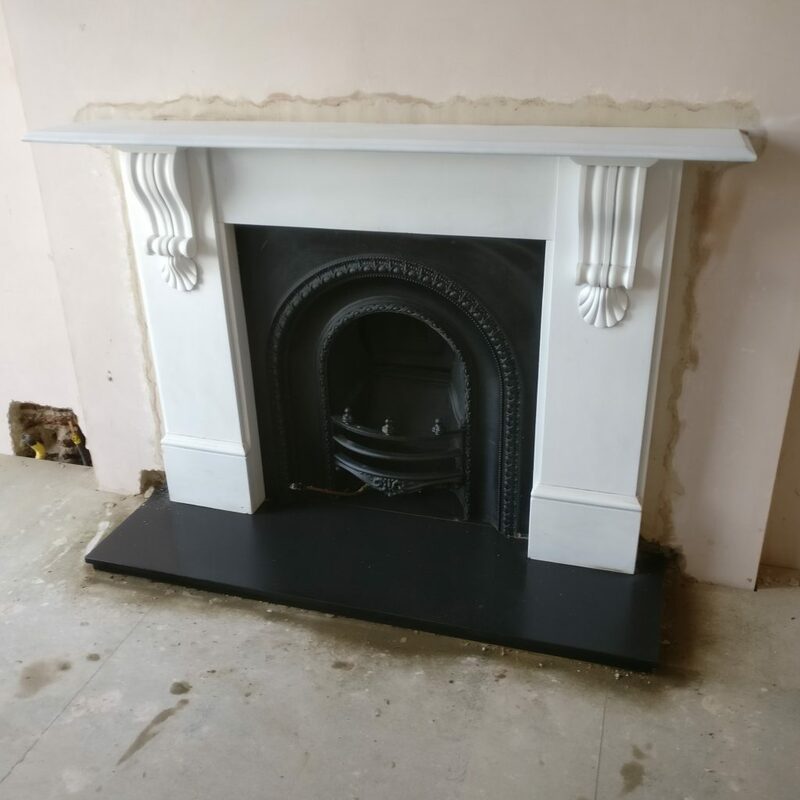 We supplied slate hearths and installed them along with the customers own original antique Victorian cast iron combination fireplaces I Haringey (N8). Sorry the blog has been completely lost of late but here’s a quick rundown of recent work, pictures will go up asap. 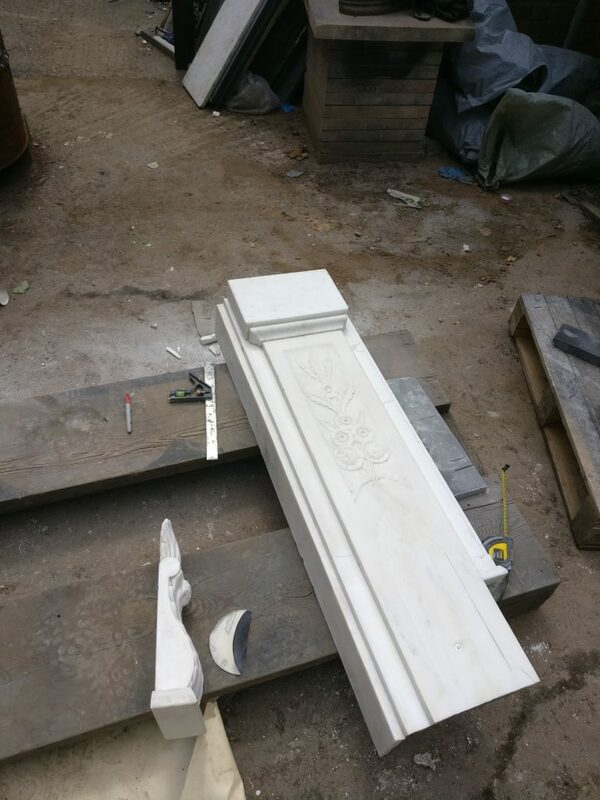 3 restorations of antique Georgian marble surrounds for a development company in Fulham (SW10) along with installation of a new surround and insert. 4 restorations of antique Victorian marble from Hampstead Heath (NW3), all installed with gas fire baskets. A cast iron surround removed, polished and reinstalled with slate hearth, chamber hearth and slips along with the chamber renders for solid fuel use. Also 3 templated hearths at same property, for a development company in West Hampstead (NW6) 2 cast iron Victorian surrounds and cast iron tiled inserts removed and sandblasted and refitted with slate hearths for solid fuel use. Also removed 1 slate surround and cast iron tiled insert which was removed and fully refurbished before being reinstalled on slate hearths, we also supplied a similar antique Victorian slate surround and tiled insert in Herne Hill (SE24) Sevenoaks (TN11), biggest job of the year, 6 Victorian marbles removed and restored with their cast iron inserts and one reproduction Victorian corbel Carrara surround supplied with an original Victorian cast iron insert, all refitted with slate hearths. Along with a host of smaller jobs, we have been very busy this summer!! “Richard of RPS Fireplaces undertook a sandblasting and pewter polishing of my 1930s cast iron fireplace, as part of a rear extension project. Fireplace restored and refitted in Teddington (TW11), Twickenham. We removed an original Victorian cast iron tiled combination from a beautiful house over looking the wall to Hampton Court. The fireplace was sandblasted and rebuilt including some extensive repairs before being refinished in our heatproof black spray paint and refitted on a slate hearth. We also installed a limestone flat Victorian reproduction surround along with a cast iron arch on a granite hearth for future use as a gas fireplace. Carron Morris fireplace supplied and installed in Canning Town (E16), East London. We supplied a Carron Morris reproduction fireplace to a customer in Canning Town. The fireplace was installed for purely decorative use. Restored original Victorian fireplace installed in Hither Green (SE13), South East London. We purchased an old Victorian “Scotia’ fireplace in need of TLC, as all restoration is done at our workshop the fireplace was completely restored with in 2 hours of arrival at the workshop and sold a few days later. 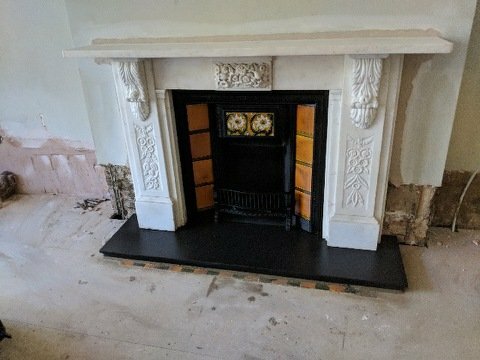 Today the restored Victorian fireplace was installed in a period property in Hither Green, along with a slate hearth for use as a solid fuel fireplace. Marble fireplaces restored and installed in Sevenoaks (TN13), Kent. We removed and restored 6 marble surrounds in Sevenoaks, we also restored 5 cast iron inserts for use with the surrounds, sandblasting and refinishing them in grate polish, supplied 2 Abbey Fireplaces Telford arches in a grate polish finish and 1 massive bespoke Carrara marble reproduction of a Victorian corbel surround. Unbelievably this was only stage one and there are more fireplaces going in for stage 2!! Keep an eye out on www.facebook.com/rpsfireplaces for the pictures coming soon. Restoration and installation of original cast iron Victorian surrounds in Beckenham (BR3), Kent. 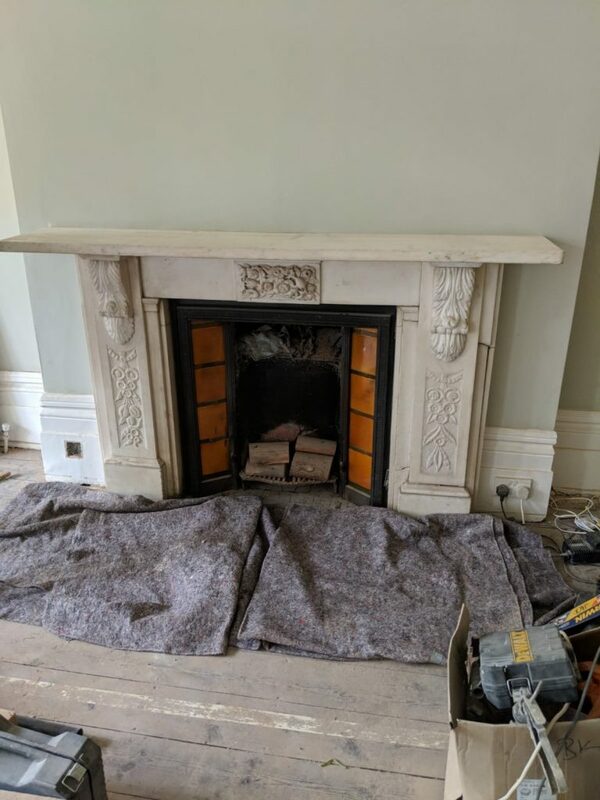 We were contacted by a customer at the very beginning of a massive refurbishment project in Beckenham, the client wanted 5 cast iron fireplaces and 2 marble surrounds to be removed, restored and refitted with slate hearths. All for use as working fireplaces. The customer was keen to use a company capable of doing all the work in house. We removed 2 Victorian bedroom combination fireplaces, 2 Victorian tiled combination fireplaces and 1 cast iron surround and insert along with 2 huge statuary marble surrounds, similar to normal carrera but with a much whiter background. 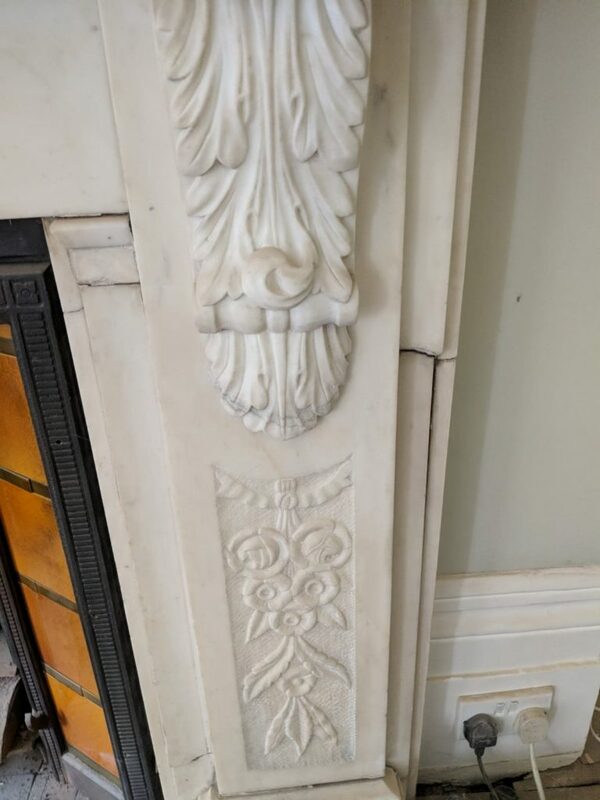 All the fireplaces were taken back to our workshop and the team began work sandblasting, rebuilding and refinishing the cast iron fireplaces, while the marble was stripped into individual panels and polished before being rebuilt. Today after an entire week of work in the workshop and half a week of installation we finished the job. Pics coming soon. 3 fireplaces restored and refitted in Wandsworth (SW18), South West London. We collected sandblasted and refinished 3 cast iron fireplaces from a customer in SW18. One large tiled combination fireplace sandblasted and refinished with a grate polish centre and white gloss exterior and 2 bedroom combination fireplaces sandblasted and refinished in a grate polish finish. All the fireplaces were refitted as decorative features. Fireplace restored and refitted in Tooting (SW17), South West London. 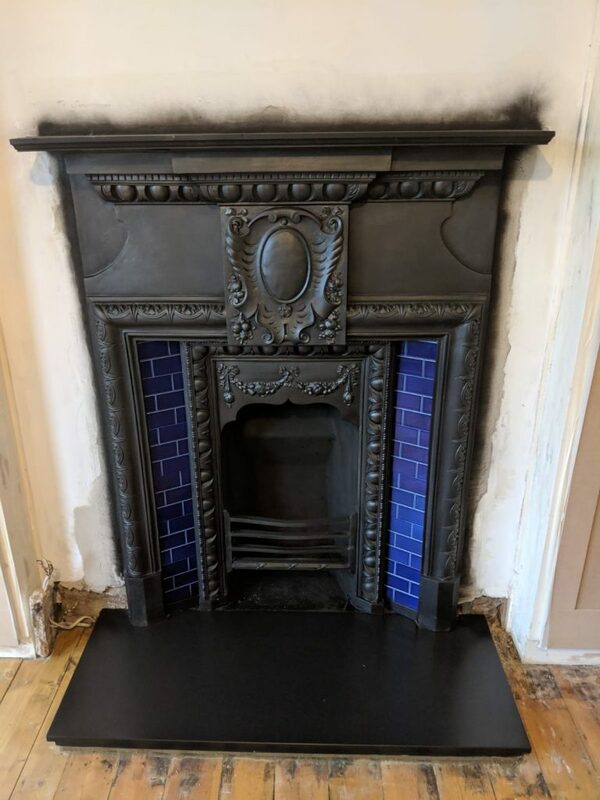 We removed a Victorian cast iron combination for restoration, the combination was sandblasted and then rebuilt with a new grate, firebrick and damper before being refinished in our heatproof matt black paint and finally reinstalled on a cut and joined solid fuel slate hearth for use as a solid fuel fireplace in Tooting. Fireplaces restored and fitted in Dulwich (SE21), South East London. We had previously removed a slate surround and tiled insert along with 2 Art Nouveau cast iron tiled combinations. All the cast iron was sandblasted and fully polished to a pewter type effect. The slate surround was separated into its original panels, then each piece was polished before the whole surround was rebuilt. Today they were reinstalled, downstairs the slate surround was installed with a tiled insert for use as a gas coal effect fire and upstairs both polished cast uron combinations were installed for purely decorative use. Fireplace restoration and fitting in Brentwood (CM15), Essex. 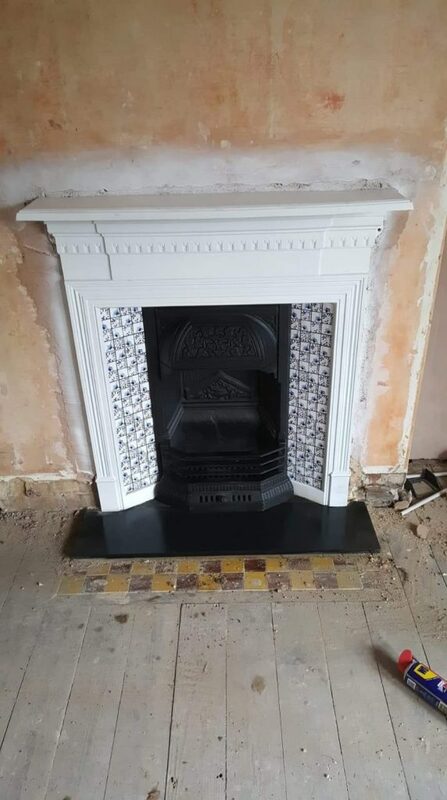 We removed an original Edwardian tiled combination fireplace, the fireplace was taken back to our workshop, sandblasted and restored back to a black finish. We then installed new tiles before fitting the fireplace back on a slate hearth. Fireplace restored and installed in East Dulwich (SE22), South East London. We sandblasted and then finished in matt black an antique combination fireplace for a development company we work with. The fireplace was reinstalled on a slate hearth in a black finish. Fireplace restored and installed in Teddington (TW11), South West London. We removed an Edwardian cast iron surround and tiled insert a few weeks ago for restoration. The fireplaces were sandblasted and refinished in a traditional grate polish finish, tiles were changed to customers preference. Then the fireplace was reinstated for purely decorative use with hearth to be tiled at a later date by the customer. Installation of 2 fireplaces in Brixton (SE24), South East London. We installed 2x limestone fire surrounds with cast iron arches and slate hearths in Brixton. One will be a gas fire and the other purely decorative. Last week we collected fireplaces for restoration from the following areas- Sidcup, Kent. Teddington, South West London. Croydon, Surrey. Shepperton, Surrey. Brentwood, Essex. Catford, South East London. Slate template hearth installed in Streatham (SW12), South West London. We returned to an old customers fireplace to template a slate hearth in Streatham. 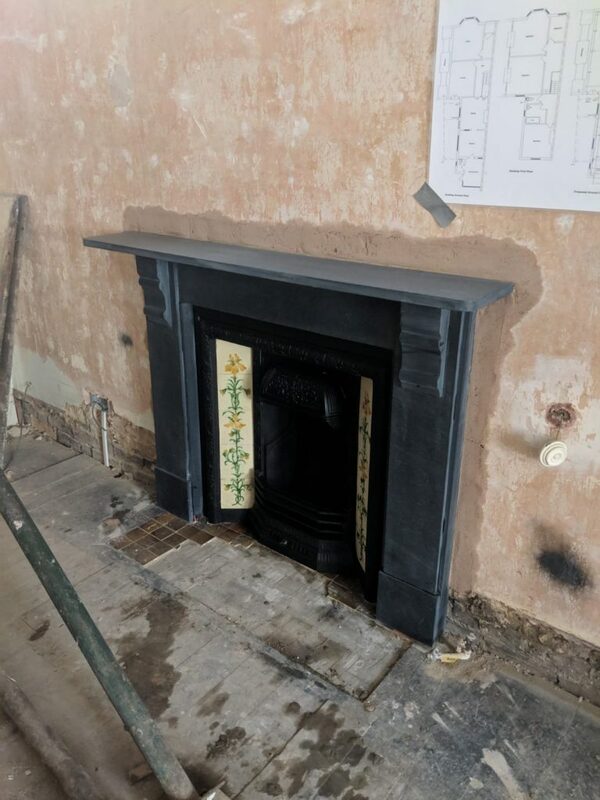 A template was taken of the shape of the from of the fireplace and transferred into a piece of slate before being cut to template and finally refitted. Fireplaces restored and installed in Wanstead (E11), East London. We restored two antique cast iron inserts, they were sandblasted and refinished in matt black with new firebricks and installed them in Wanstead. One was installed with a slate hearth and a bespoke pine surround in a white primer for use as a gas coal effect fire and the other was installed with a slate hearth but purely for decorative use. Restoration and fitting in Beckenham (BR3), Kent. We removed an original Victorian green marble effect slate surround and tiled insert for restoration. The slate surround was separated into panels and re-polished before being re-assembled. The cast iron insert was sandblasted and refinished in a matt black paint and the whole fireplace was reinstated for solid fuel use. The plasterwork is still to be done and the fireplace is freshly oiled. Antique fireplace supplied and installed in Catford (SE6), South East London. We supplied a restored antique Victorian combination fireplace and a solid fuel slate hearth. The fireplace was installed as a solid fuel working fireplace in Catford, South East London. Fireplace fitting in Brockley (SE4), South East London. We removed a wooden surround and cast iron tiled insert, removed the old tiles and replaced with new Carron tubelined tiles then refitted the insert and surround on a new slate hearth for use as a solid fuel fireplace. Customers own wood surround and arched insert fitted for gas use with a Carrara hearth in Brockley (SE4). Fireplace parts installed in situ in Sydenham (SE26). A decorative slate hearth installed in Balham (SW12). A chamber opened up with brick pillars built to support an oak beam, plastered with the chamber walls rendered with a heatproof render, slate hearths laid ready for a stove to be installed in Gypsy Hil (SE19). A limestone surround with limestone panels and hearth installed for use as a gas fire in Tooting (SW17). In Richmond (SW14) we removed a cast iron tiled insert for restoration. 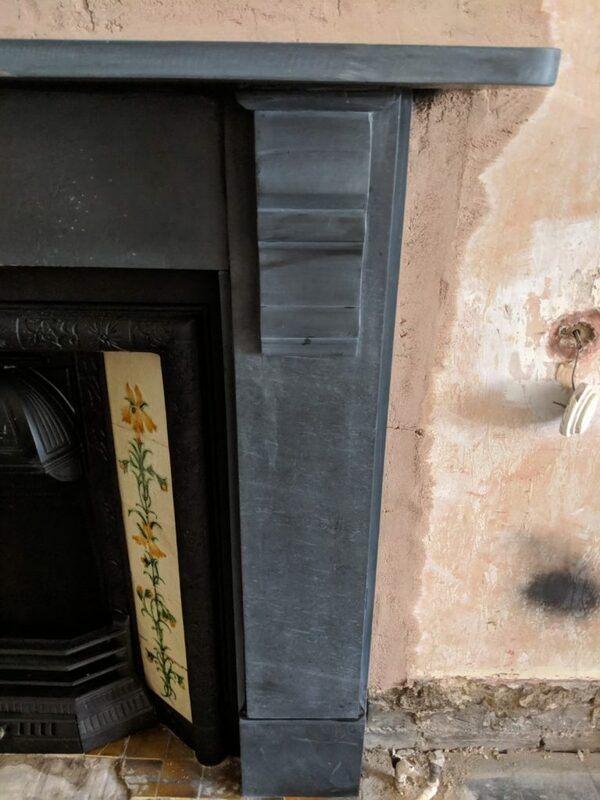 It was sandblasted and refinished in our matt black spray before being reinstalled with a beautiful small original period Carron cast iron surround and a small slate hearth. Restored original fireplace installed in Kidbrooke (SE3), South East London. We picked up a Victorian cast iron combination for restoration, the customer had spent a fair amount of time trying to strip it by hand before giving up and calling us in. We took the original fireplace back to our workshop where it was sandblasted and refinished in our heatproof black paint. Before being returned and refitted for solid fuel use on a slate hearth. We supplied and installed 2 original cast iron combinations, both installed with slate hearths for solid fuel use in Catford (SE6). Pics to follow. Victorian fireplace restored and refitted in Forest Hill (SE23), South East London. 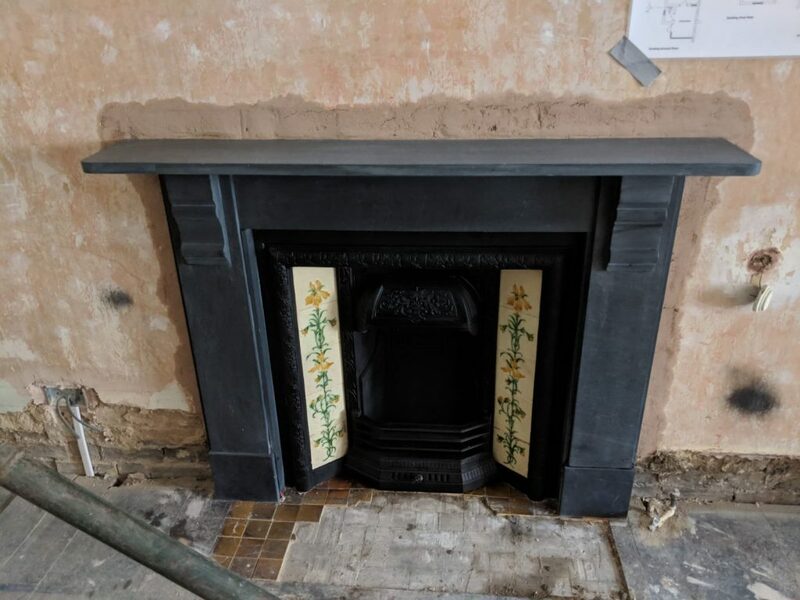 We returned to a job from last week in Nunhead (SE15) to finish the forth restored Victorian slate surround and cast iron insert, fitted as a purely decorative feature with a slate hearth. Marble fireplaces restored and installed in Beckenham (BR3), Kent. 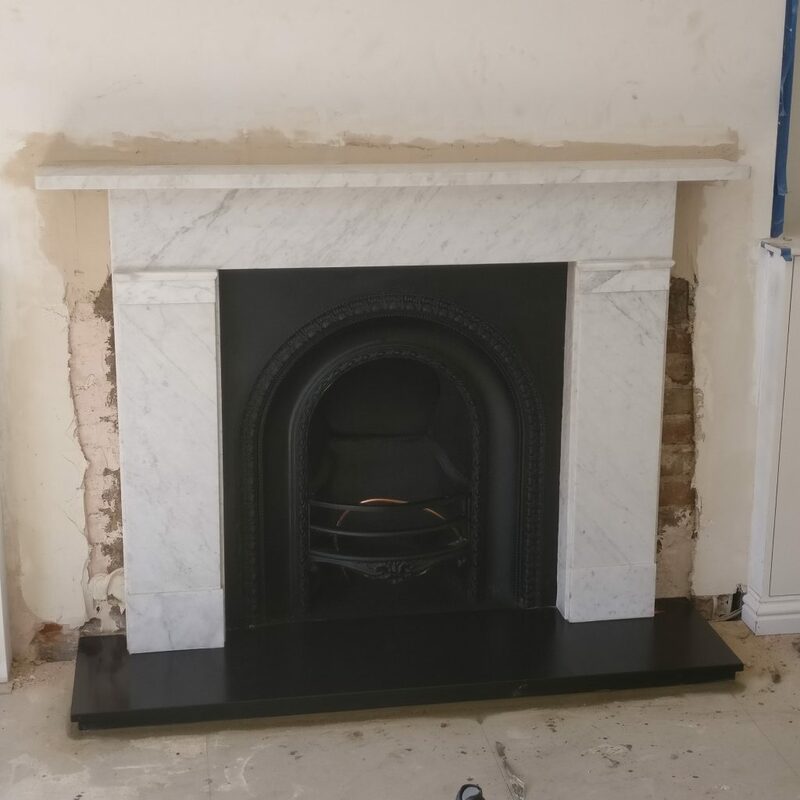 Earlier we removed 4 fireplaces from a period property being fully refurbished in Beckenham, 3 Carrara marble surrounds and a slate surround. All the stone was stripped, polished and rebuilt. The cast iron inserts were sandblasted, repaired and sprayed with our matt black paint. Today the 3 restored antique Carrara marble surrounds were refitted for decorative purposes, the customer is doing there own plastering. We are one the only places (if not the only place) in London and surrounding areas capable of carrying out all the work in house at our Sydenham (SE26) workshop, no need to out source. Restored original fireplaces installed in Nunhead (SE15), South East London. We installed 3 previously restored antique slate surrounds with original Victorian cast iron inserts and slate hearths. These fireplaces were all installed as purely decorative pieces. We are returning next week to install a 4 the one. Fireplace supplied and installed in Bromley (BR2), Kent. We supplied and installed a bespoke pine surround with an Abbey Fireplaces Sheldon arch insert and a solid fuel slate hearth for use as a solid fuel installation. In situ restoration of fireplace in Crouch End (N8), North London. We removed the old cast iron back and replaced it with a new firebrick back, along with a new grate and a front bar and ashcover set for use as a working solid fuel fireplace. Antique Victorian fireplaces supplied and installed in Brockley (SE4), South East London. We supplied 2 matching Victorian antique cast iron tiled combinations, along with slate hearths. One was installed as a gas fireplace and the other as a purely decorative fireplace. Fireplace restoration and installation in Clapham (SW4), South West London. We restored and installed 2 original marble surrounds with 2 antique Victorian cast iron tiled inserts. One with a slate hearth and the other installed on the original Victorian tiled hearth, which will be re tiled eventually in Clapham, South West London. Fireplace restored and refitted in Hornsey (N8), North London. Fireplace installed in Plumbstead (SE18), South East London. We supplied a slate hearth for solid fuel use and installed it with a restored Victorian cast iron tiled combination. It was necessary to refix the shelf to the combination and cast a new firebrick in order for the fireplace to be used as a working fireplace. Carron fireplace installed in Dulwich (SE21), South East London. In Dulwich, South East London we supplied and installed a Carron Melrose combination fireplace along with a slate hearth for solid fuel use. The slate hearth was sized a little larger than normal to hide a patch in the flooring. Fireplace restored and fitted in East Dulwich (SE22), South East London. 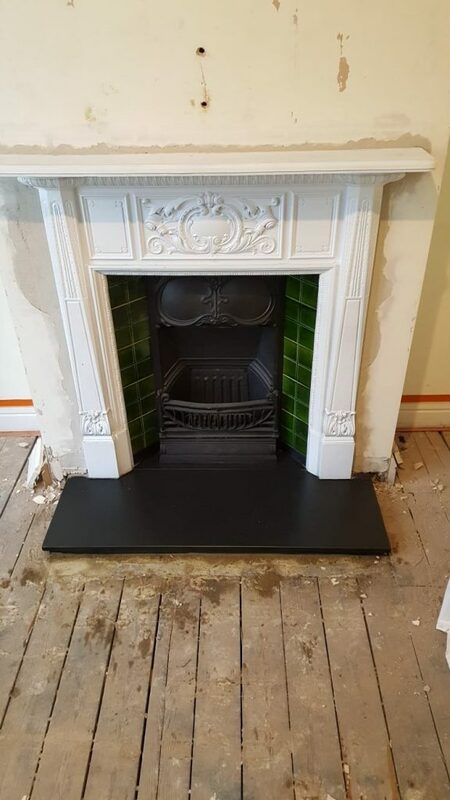 We removed a Victorian tiled cast iron insert for some basic restoration in East Dulwich, South East London. Once it had been removed from the wall, we cut off the old corroded fireback and replaced it with a new cast iron fireback. Then the whole fireplace was refitted with a new bespoke slate solid fuel hearth replacing the tiled hearth that had previously been installed. After restoration Before restoration. We supplied a made to measure pine Victorian corbel surround and a bespoke solid fuel slate hearth for use with a customers restored Victorian cast iron tiled insert. The fireplace will be used as a solid fuel fireplace. We took on a complete restoration of a Victorian combination fireplace. The restoration included sandblasting, replacing the hood, welding the back and refinishing in our black heatproof paint. We are one of the only, if not the only company, who can carry out this sort of restoration in house from start to finish. The fireplace at our starting point, note the hood had previously been broken off. The same fireplace after sandblasting, the hood and a set of front bar and ashpan cover had been added. We still had the firebrick to set and the spray paint finish to complete. The fireplace with firebrick set. The paint is still wet at this point. . Restored fireplace fitted in Sydenham (SE26), South East London. We installed a restored Victorian tiled combination fireplace with a slate hearth for use as a solid fuel fireplace in Sydenham, South East London. Limestone suite fitted in Streatham (SW12), South West London. We installed a purely decorative limestone suite in Streatham, South West London. Fireplace supplied and fitted in East Dulwich (SE22), South East London. We supplied a made to measure pine surround and custom sized slate solid fuel hearth with an Abbey Fireplaces Sheldon cast iron arched insert for use as a solid fuel fireplace. The surround was primed white ready for the customer to apply a top coat. Fitted with the best selling Abbey Fireplaces Sheldon arch insert in black and a cut and joined solid fuel slate hearth in East Dulwich, South East London. We had 2 tables in the workshop today in need of an overhaul. Paint was stripped from the legs and base and then the base was polished by hand, unfortunately some of the chrome plating was too far gone and some rust remains. The table top was polished by machine to a high finish. Before restoration of the table. After the restoration process. Restoration and fitting in Brentwood (TW8), West London. 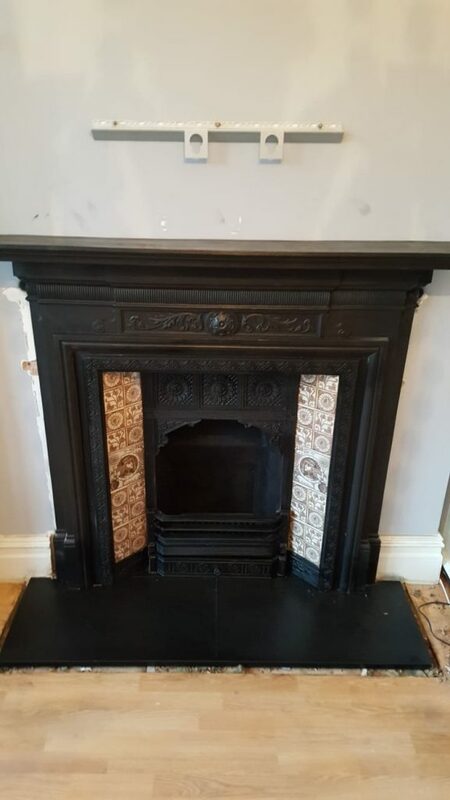 We removed an antique original Victorian cast iron surround and Victorian cast iron tiled insert fireplace for restoration. Once back in the workshop it was all sandblasted in house to get it back to the bare metal of the original casting. From there a light coat of black paint was applied before everything was polished to produce a pewter like effect, the remaining black paint in the depth of the detail makes everything stand out and makes a stunning fireplace. Once refitted, we tiled the hearth with the customers own tiles. The fireplace was fitted as a purely decorative feature, maybe one day housing a gel burner. Pics up soon. Restored fireplaces installed in Brixton (SW2), South West London. We installed 2 matching original Victorian tiled inserts with marble surrounds and slate hearths in Brixton, South West London. We had previously restored the cast iron inserts, sandblasting and refinishing to traditional grate polish finish, they were fitted with new reproduction tiles before being installed with the marble surrounds and slate hearths for use as solid fuel fireplaces. Restored fireplace installed in Hertford (SG13), Herefordshire.